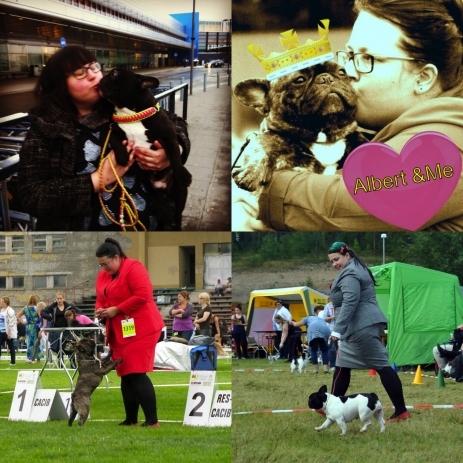 My name is Camilla Lund, a 37 yrs old French Bulldog lover from the northern parts of Sweden, close to the polar circle. I live in a house just outside a small town called Boden. 1000 kilometers from our capital Stockholm. My dogs lives with me like a loving part of my family. They sleep with me in my bed and are allowed everywhere in the house. Just like it should be! I have completed the Swedish kennel clubs breedingeducation and have a diploma in all six courses. I work as a ringsteward when I’m not away on a shows with my own dogs. I am also educated as a dog show organizer by the Swedish Kennel Club. I have a genuinely intrest for the breed and are eager to learn more. I like to go to seminars and courses when I have the time. Please contact me if you have any questions or are intrested in a puppy. And if you see me at a dogshow, come by and say hello! Its always nice to talk to other enthusiast or if you are just interested in this lovely breed. I talk swedish and english.